The earth is being incessantly bombarded by a stream of energy-rich particles from the universe. By means of a new observatory a group of astrophysicists aims at tracking down the cosmic events that trigger this particle storm. Their telescopes are located on Las Palmas and in Chile, while the scientific coordination is domiciled at DESY in Zeuthen near Berlin. That was the venue for our interview with the coordinators regarding what their plans for the project are. The star-studded sky at night appears to be serene when viewed with the naked eye. But in reality, a permanent storm is raging out there: stars explode, black holes come into existence, and our planet earth is persistently bombarded by energy-rich particles. We barely notice anything going on. These events only become noticeable through highest-energy gamma rays, gravitational waves or neutrinos that can be measured with the aid of telescopes. In order to better understand what processes are playing out in our universe, an observatory for gamma-ray astronomy – the so-called CTA Observatory (CTA – Cherenkov Telescope Array) – is to be built. DESY in Zeuthen plays a central role in these plans – the project will be scientifically coordinated from there in the future. We spoke with Zeuthen scientists Christian Stegmann, Gernot Maier, Johannes Knapp and Stefan Schlenstedt about the project. Our planet is being bombarded with high-energy particles. How are we supposed to comprehend this, and what is known about the particles? Christian Stegmann: We know that, in our universe, elementary particles such as protons and electrons are accelerated to powerful energies that lie far beyond our capacities of what we can achieve with particle accelerators such as the LHC on earth. We have been aware of this current of high-energy particles, the so-called cosmic radiation, for more than 100 years now. But we don’t know where the accelerators are and how they work. Are they supernova remnants, remnants from powerful star explosions, the surrounding areas around black holes, or perhaps they are objects that we simply haven’t recognised? With CTA, we will find answers to these questions and understand what impact these high-energy particles have upon the development of our universe. What does CTA stand for, and what exactly is concealed behind the name? Christian Stegmann: CTA is the abbreviation for Cherenkov Telescope Array, a technology of gamma-ray astronomy. It is based on observation of Cherenkov flashes (explanation in box), i.e. of particle showers that can be measured with special telescopes. CTA is, first of all, a method of observation. Particularly, it involves constructing an observatory that investigates gamma rays. What significance does the construction of such an observatory have for astrophysics? Johannes Knapp: It represents the next and most important step if we want to advance the research. The three most important projects in gamma-ray astronomy from the past – H.E.S.S., Magic and Veritas – established the foundation, but in principle they only showed us for the first time that a plethora of sources exist, and they were able to localise them. In the CTA project, experts have come together from all three projects in order to take the next step. What can the planned CTA observatory achieve that the previous projects haven’t been able to achieve? Christian Stegmann: We have now measured the first high-energy cosmic neutrinos. We have information about the highest-energy-charge particles in the cosmic radiation, and gravitation waves have recently been proven for the first time. All of this serves as evidence for astrophysical events with the help of which we are trying to comprehend how our universe works. We are currently getting new information from diverse corners in the world of astrophysics. I have the impression that we are sitting in a dark room where only dim little lights are on, but we don’t know at all what to expect. We are, so to speak, repeatedly turning on new lights in different locations. But we have found out in general that the high-energy processes, such as exploding or collapsing stars, are playing a much more significant role than we had previously thought. Gernot Maier: In order to understand the development of our Milky Way, we have to understand these high-energy processes – and for this we need CTA. With the instruments that we’ve used so far, we have been able to take a look for the first time to see what’s even up there. Thanks to multiple years of observations, we were able to then show that the universe is full of extreme accelerators, and that there exist extremely diverse phenomena such as supernovas, black holes and huge magnetic fields. Johannes Knapp: The issue in this next step is systemisation of the discoveries. In other words, we are stepping back from making individual discoveries, and as an alternative trying to better understand them as groups. For this CTA is required, since the previous measuring instruments have been simply too small and not precise enough. What is it then that CTA can accomplish so much better than the previous measuring instruments? Stefan Schlenstedt: The overall dimension is entirely different. 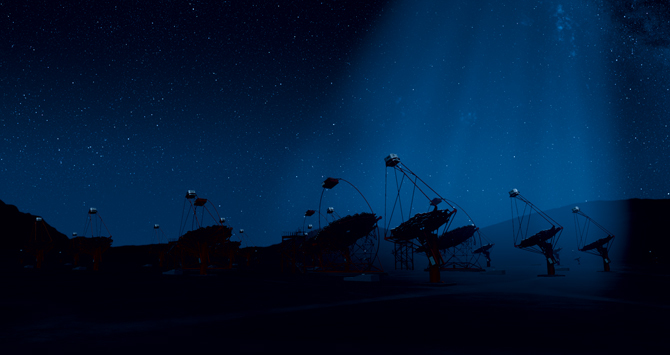 Two telescope fields are to be built for the CTA observatory – one on the Canary Island La Palma and one in Chile. Three different types of telescopes are to be built that are precisely synchronised to one another and have different functions. The telescope field in the South, for example, will consist of four large telescopes in the middle that are surrounded by 15 medium-sized ones, and then yet another field of about 70 small telescopes. In this manner we can accomplish larger energy coverage and higher precision of measurement than in the previous experiments. We are thus able to work with more precision and can collect more comprehensive data. What is the objective of these investigations? Christian Stegmann: There are a lot of different objectives. Quite fundamentally, we want to find out where the radiation originates and how the particle accelerators function. In other words, we want to show with the aid of our data how the particles are accelerated and within what timeframe. Gernot Maier: Due to the fact that so much data is generated, we would hopefully be able to clear up a lot of different physical questions. We could for example examine how far shockwaves fly through the universe from powerful Milky Way star explosions, or how tremendous maelstroms surrounding black holes are able to sweep away matter. There are thousands of possibilities and therefore thousands of opportunities for discovering new things. Zeuthen is now the site for the Science Data Management Centre of the CTA Observatory – how did this come about? Stefan Schlenstedt: The decision that we want to establish CTA here in Zeuthen in the future was made about eight to ten years ago. We considered at that time how the site could be configured, and CTA was perfectly suitable to our needs – both strategically and in terms of expertise, since there had previously been strong emphasis on particle astrophysics. Furthermore, it was a good fit with the general strategy for research in the field of astrophysics in Germany and Europe. As it became clear that we want to concentrate on this in the future, we began piece by piece to bundle the expertise here and bring experts to Zeuthen. So that’s the way the location established itself as a leader in German particle astrophysics. Johannes Knapp: And now to become the location for the central Science Data Management Centre of the CTA Observatory – that is more or less the next logical step. This is primarily due to the fact that Helmholtz and DESY have already proven that they are capable of tackling the corresponding challenges. For astrophysics in Germany, what has been the significance of DESY’s entry into CTA research? Christian Stegemann: The entry back then lifted the entire field of German particle astrophysics to a completely new level. Previously it had been mostly small experiments conducted by individual groups that produced and analyzed all of the data for themselves. Through Helmholtz, we are counting on a large infrastructure that is centrally administrated, but can in principle be used by research scientists from all over the world. The entire particle astrophysics field benefits from this. Gernot Maier: That is also one of the key elements in this project. We want to be an Open-Access-User-Facility that makes the measuring data available to anyone who would like to have it. Only in this manner we can achieve further advances in the area of astrophysics, thus enabling us to understand our universe step by step. We have to bundle expertise worldwide so that we can introduce as much light as possible into that dark room. Stefan Schlenstedt is the leader of the CTA Group at DESY and Coordinator of the MST project in CTA (MST = Medium Size Telescopes). Gernot Maier is the assistant leader of the CTA Group at DESY and Coordinator of the CTA simulations studies in CTA. Johannes Knapp is Coordinator of the German CTA contributions (in addition to DESY, two Max Planck Institutes and nine German universities are involved). Christian Stegmann is Director of the DESY location Zeuthen. Furthermore, he is the German representative in the CTA Council. When extremely energy-rich gamma radiation from space collides with the earth’s atmosphere, it produces short, blue-light flashes – Cherenkov flashes. Scientists are in a position to measure and analyse these events that last only billionths of a second, thus enabling conclusions to be drawn regarding the cosmic events that originally emitted the gamma rays. This can involve supernova explosions or the interior of a far-away galaxy. The energy and, most of all, the location within the universe from which the high-energy radiation comes can thus be determined. This is why one speaks of gamma-ray astronomy. These Cherenkov flashes are of extremely short duration and not detectable to the naked eye. The impact of the energy-rich gamma rays immediately produces an entire avalanche of new, small so-called secondary particles that move through the atmosphere. In order to measure the radiation, astronomers hence are using several telescopes and detectors at the same time that they join together into one observation facility – such as the Cherenkov Telescope Array (CTA).